We painted all nails with the perfect non-toxic super rich red — “Paris, Paris” by Treat Collection, (also available to our European readers here! Hooray!) You’ll want to wait a couple of hours in between painting your nails red & adding the gold leaf hearts so that the gold leaf sticks does not stick to the red polish. You’ll want it to stick to the clear polish in step 5. Once your color is completely dry, grab your book of gold leaf sheets and select a single sheet. Break the piece into smaller pieces, about the size of your finger. Get out a toothpick and dip it in your clear top coat. Here we used the clear top coat which is also from Treat Collection. Okay, remember our heart tutorial here? 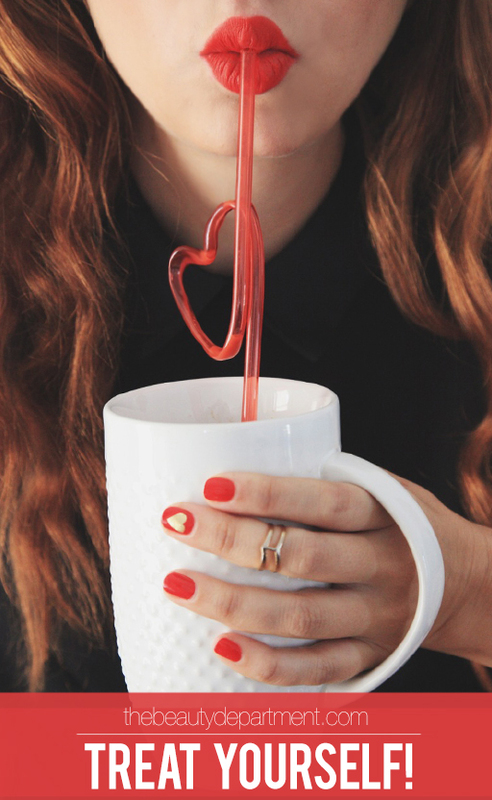 Use this method with the toothpick to make a clear heart on top of your nail. You can actually make any shape using this method (like lips or an “xo”), but we think a heart is easiest to start with. Make sure you’re in a well lit place so you can see the clear while you’re making your heart shape. Pick up a piece of gold leaf and lay it over the clear heart and tap it lightly a few times. Now wait for 10 minutes while the polish and gold leaf FULLY adhere together. Use an paint brush to dust off the excess gold leaf. Once you clear all the gold, the heart is what’s left! Use your “Paris, Paris” to perfect the edges of the gold heart if you feel like you need it. Add a clear coat to the top of each nail. These nails are so gorgeous. The gold starts to chip away after a few days but we kind of love it because distressed gold leafing is still very pretty.